Have you ever been totally obsessed with a particular food item? So much so that you can't stop thinking about it? I've had this problem with soft pretzels lately. 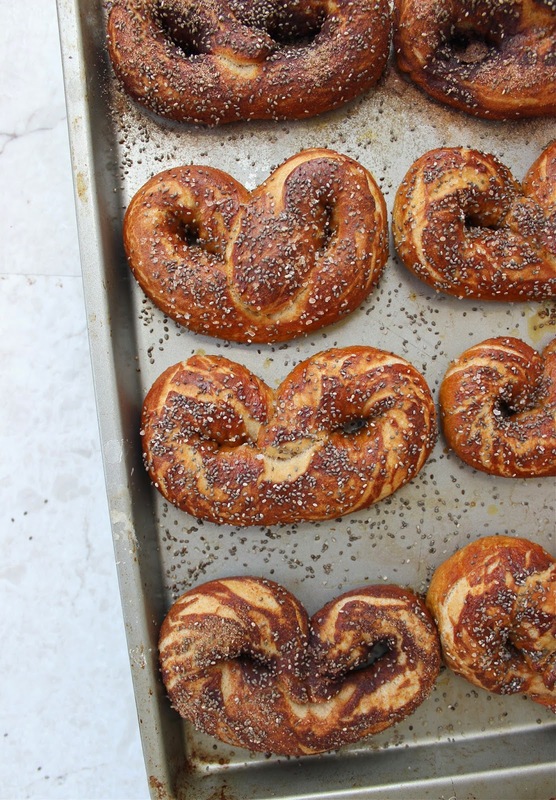 It all started with a Smitten Kitchen post about soft pretzel buns. 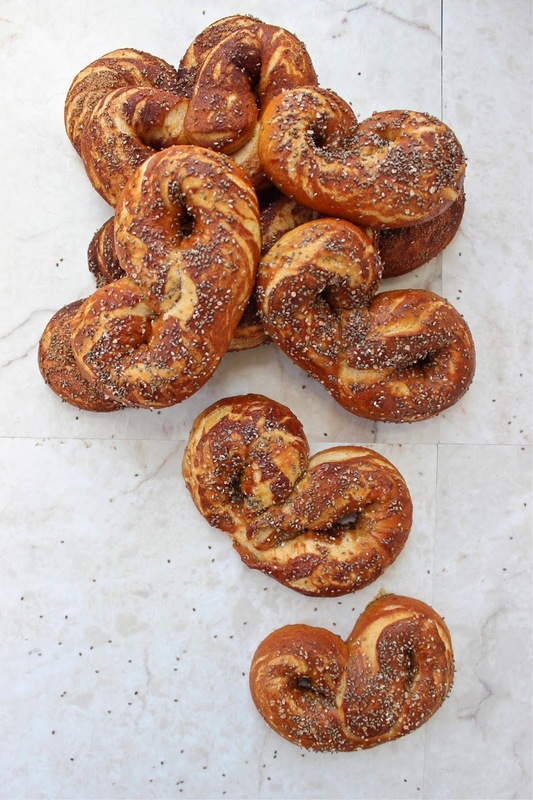 Then my friend Kara told me about Deb's chocolate chip brioche pretzels. Then I went to the mall with my friend Steph and bought a soft pretzel from the Auntie Anne's kiosk. It was soft and salty and buttery and delicious, and I thought it would satisfy my soft pretzel craving. 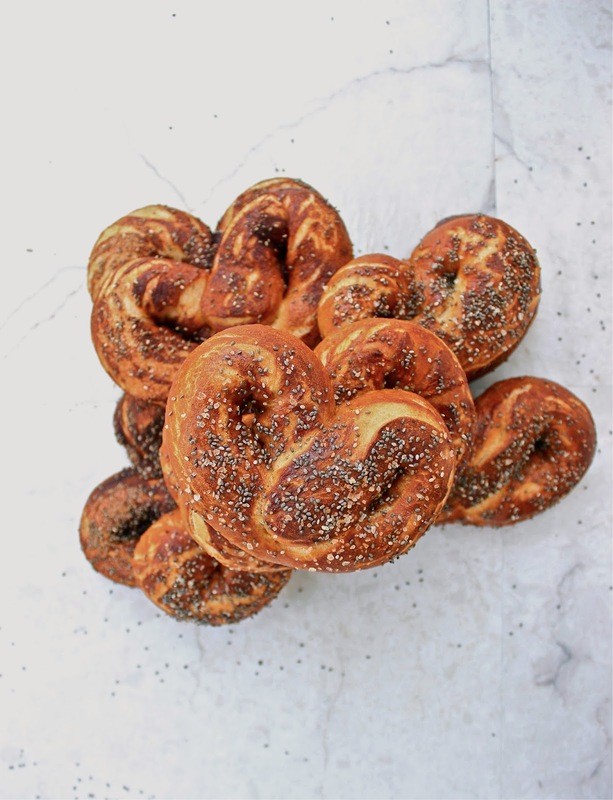 Then, two of my other favorite bloggers posted soft pretzel recipes… (jalapeño pretzel dogs and soft pretzel ice cream sammies) on the same day! ENOUGH. I had to make my own. These were just destined to happen. To justify having twelve of these in my house at one time, I had to make a healthy twist on the original soft pretzel recipe. BUT, it still had to be traditional enough to satisfy my soft pretzel craving. These did both. The whole wheat flour is unnoticeable in these, but the honey adds the perfect amount of sweetness. The chia seeds are an additional health boost and provide a nice crunch. When I gave Adam one, his response was, "These are good. What are the black things on top?" "As in, Chia Pet chia seeds?" "No, as in chia seeds, the good-for-you seeds people sprinkle on oatmeal and in smoothies." Then I googled chia seeds and discovered that Adam is right. Chia seeds are none other than the seeds from the Chia Pet. Who knew? They're definitely good for you though, and much more useful sprinkled on top of food than growing funny green plants, if you ask me. Since there are several steps involved in the recipe, I made you a how-to video. It's a slight improvement over the last one, but the quality is still lacking and I didn't realize until afterwards that shooting video vertically doesn't really make sense, sooooo there's a lot of black space. I'm learning! Thanks for putting up with me. Prepare a clean surface with flour. Combine warm water, yeast, and honey in a small bowl. Let sit for 5-7 minutes until yeast is bubbly. Return the dough to the bowl, cover with plastic wrap, and let it sit in a warm place for an hour or until dough is doubled in size. Preheat the oven to 450 and spray two cookie sheets liberally with non-stick cooking spray. In a large sauce pan, bring the 10 cups of water and baking soda to a rolling boil. Meanwhile, return the dough to the flour surface. Cut dough in half, then cut each half into half again, then cut each half into 3 pieces, for 12 pieces total. Role each piece out into a 24 inch rope. Make a U shape, then bring the ends of the U into the middle and press firmly to seal. Carefully drop each pretzel into the boiling water, two at a time, for 30 seconds, then place on the prepared cookie sheet. uh oh..now I'm in trouble..soft pretzels…where art thou? I, more often than not, end up with a Auntie Anne's pretzel in my hand every time I go to the mall. But since I've mostly been doing online shopping, I forget its deliciousness. I love the addition of whole wheat flour and chia seeds. Tim doesn't like them, and I haven't figured out a way to sneak them in either..Last time I tried (in a granola) he said, "how could you! I KNOW you put chia seeds in there..they're all stuck in between my teeth." Oops. Loved watching the video. The ending def is the highlight ;). You guys are so adorable! Hope you had a lovely weekend, Trisha! 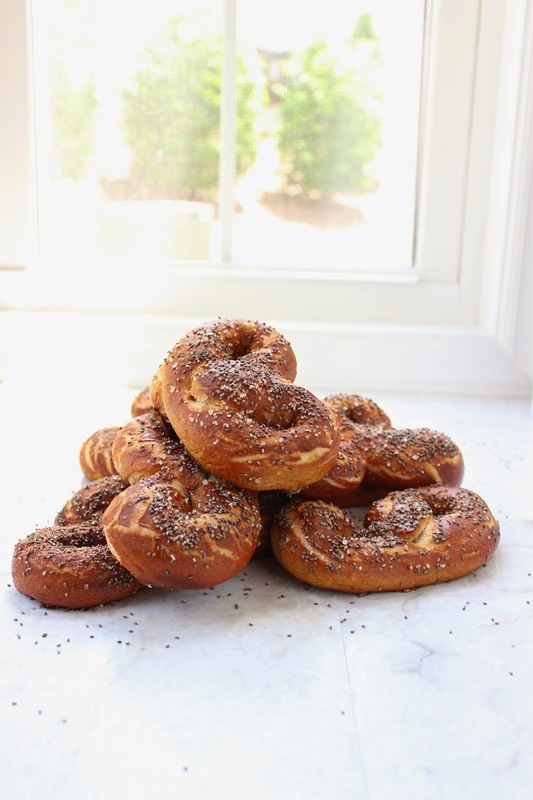 I am always in the midst of a soft pretzel craving, so you are just preaching to the choir! And no, Auntie Annie's doesn't satisfy my cravings much anymore either! But these? These will do just fine. I made soft pretzels for the first time earlier this year (at Superbowl time) and they were terrific - totally worth it. These look really perfect - so browned and pretty looking! I like the idea of adding some Chia seeds on top as well. Oh man, I *love* soft pretzels! I tried to make 100% whole wheat pretzels the other day, but they were way too dense. Yours look absolutely perfect and I love the addition of chia seeds! Smart! 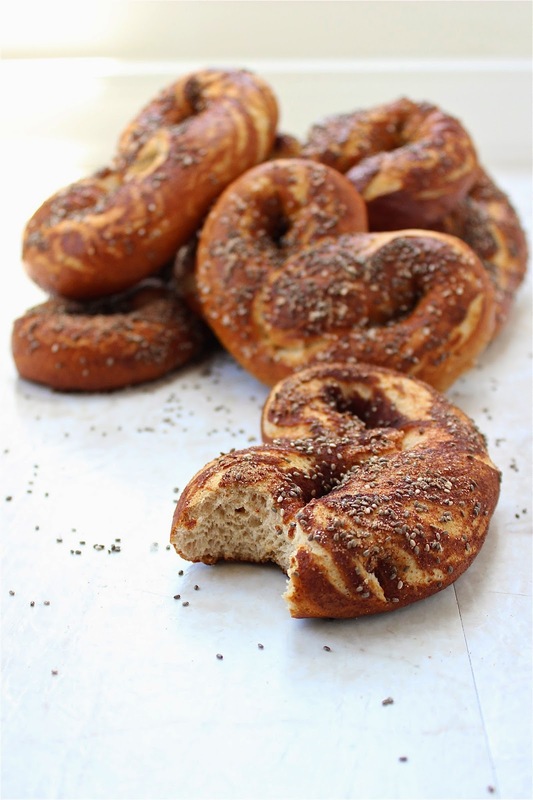 Once i tried this wheat soft pretzels but i cant make it perfect because i add honey more and now i tried this. so add this in your limit and less amount.